Headquartered in Cupertino, California, Apple Inc (NASDAQ:AAPL) designs, manufactures, and markets mobile communication and media devices, personal computers, and portable digital music players. The company also sells a variety of related software, services, peripherals, networking solutions, and third-party digital content. AAPL was founded in 1977. The company's products include iPhone, iPad, Mac, iPod, Apple TV, Apple Watch and a portfolio of consumer professional applications as well as the iOS and Mac OS X operating systems. AAPL provides online access to digital content and applications through the iTunes Store, App Store, iBooks Store, and Mac App Store. The company also provides a cloud service called iCloud and Apple Pay for making mobile payments. AAPL distributes its products worldwide through its retail stores, online stores, and direct sales force, as well as through third-party cellular network carriers, wholesalers, retails and value-added resellers. The company started paying dividends again in 2012, so it doesn't have the established track record of dividend payments and increases I look for normally. In this article I'd like to present my case for buying AAPL shares for DivGro, my portfolio of dividend growth stocks. 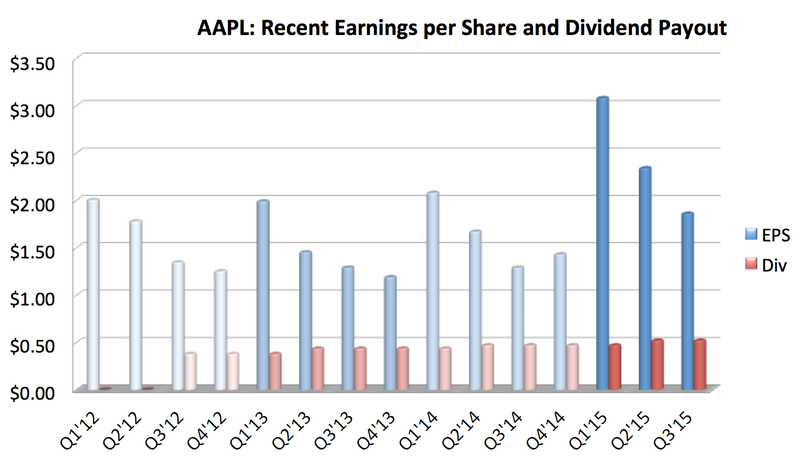 AAPL pays quarterly dividends of 52¢ per share in the months of February, May, August and November. At the closing price on Friday, 21 August 2015 of $105.76, the stock yielded 1.97%. The timing of my purchases was less than stellar, so I secured initial yields on cost (YoC) of 1.71% and 1.77%, respectively. 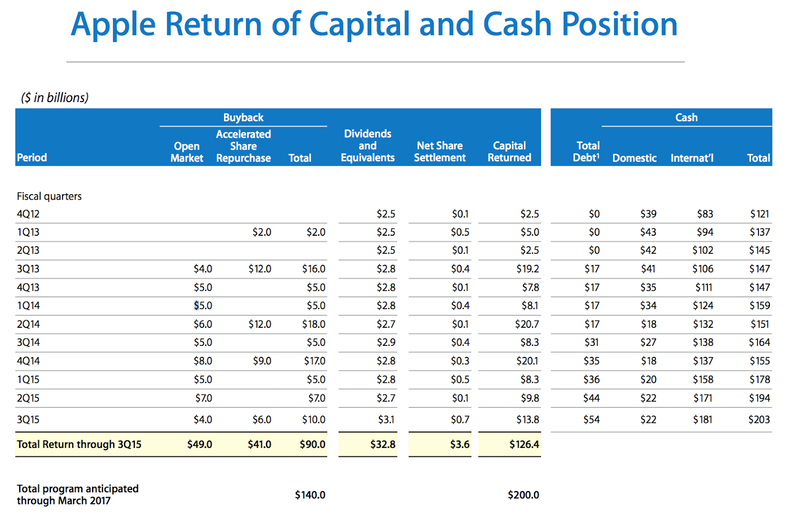 According to GuruFocus, AAPL's dividend payout ratio is 22%, which is ranked higher than 99% of the 1,280 companies in the Consumer Electronics industry. The median dividend payout ratio of the Consumer Electronics industry is 35%. 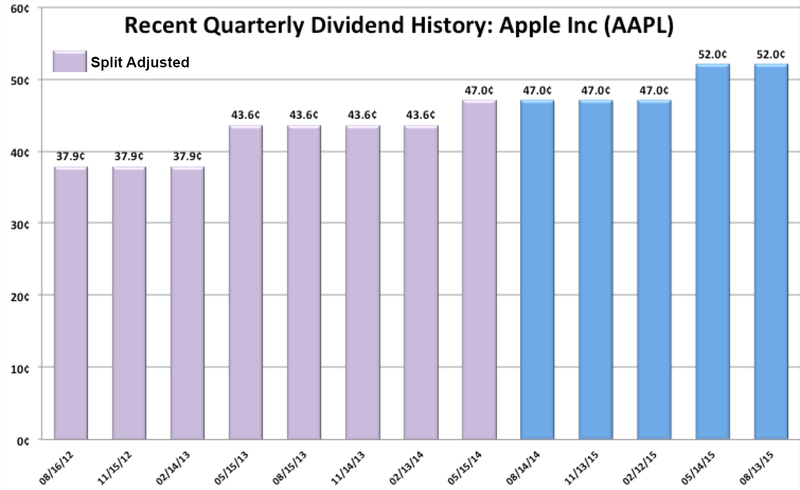 With AAPL's short history of only 2 years of dividend increases, DGR (compound annual dividend growth rate) is not such a big factor in my decision to buy AAPL. Nevertheless, assuming AAPL pays 52¢ in November 2015, the 1-yr DGR would be 9.97% and the 2-yr DGR would be 9.73%. Notice also that AAPL's buybacks total $90 billion over the same period and that the company anticipates to return about $73.6 billion in dividends and buybacks through March 2017. In the last 10 years, AAPL has outperformed the S&P 500 by a margin better than 15-to-1, which is a remarkable performance. 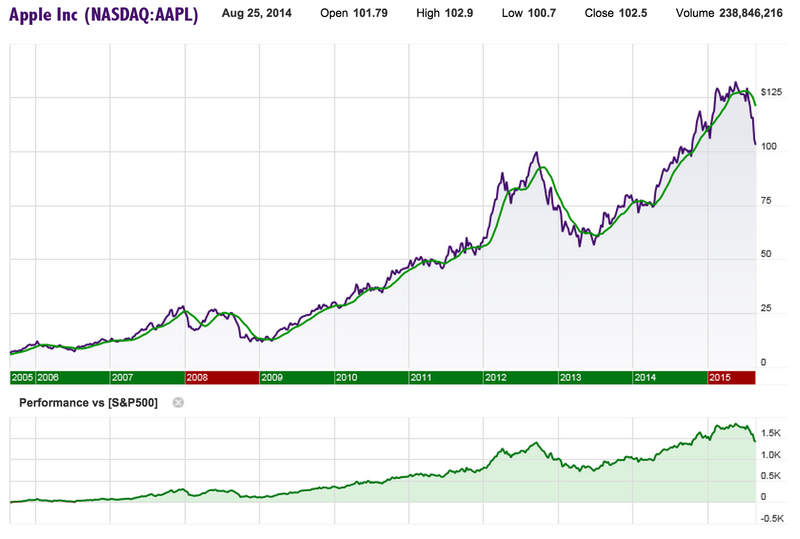 The following 10-year charts show the split-adjusted price of AAPL and the stock's performance relative to the S&P 500. In the price chart, the gold-colored line represents the 13-week exponential moving average. 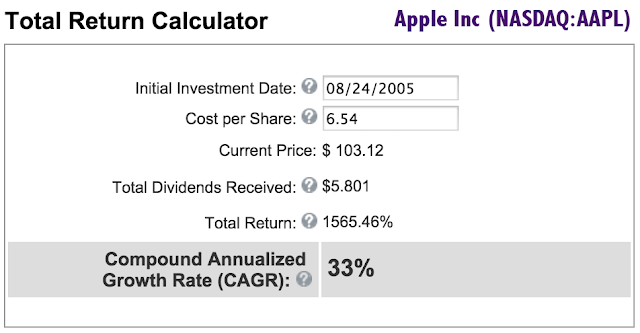 An investment in AAPL 10 years ago would have returned 1,565%, including dividends. That equates to a compound annualized growth rate of 33%, which is very impressive! My fair value estimate of AAPL is $127.50, so I bought shares at a discount of about 6%. The following table provides some key statistics, with highlighted values relating directly to my selection criteria. Here is the earnings and price correlated F.A.S.T. 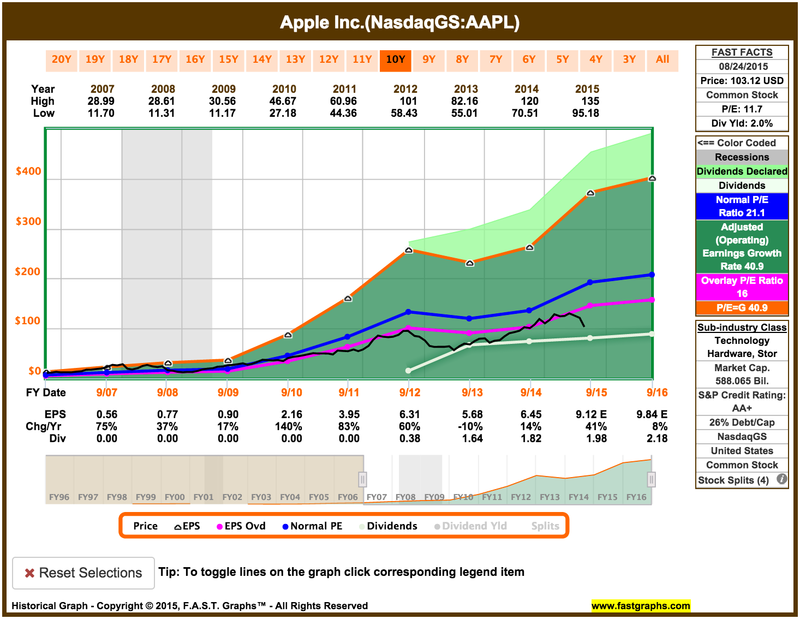 Graph for AAPL, in which I've activated an overlay P/E Ratio of 16. The 9/30/2016 price estimate at a P/E of 16x is $157.44. Despite reporting record third quarter results in July, the company's stock price dropped on concerns about China growth prospects. Earnings of $1.85 per share increased 44.5% year-over-year on a surge in iPhone and Macintosh sales as well as higher services revenues. Total revenues increased 32.5% year over year to $49.6 billion. The company forecasts revenues in the range of $49 to $51 billion for the fourth quarter. Risks for AAPL include significant competition in most of its operating markets, including from market leader Hewlett-Packard in the computer segment, Samsung in the smartphone segment, and from Google's Android on the software side. The company is heavily dependent on iPhone and iPad sales and increased competition will hurt AAPL's top line and profitability. Other risks include slowing iPad growth and the various legal battles AAPL is entangled in. Of course, there are many reasons to buy, the most important one for me as a dividend growth investor being AAPL's increasingly favorable treatment of shareholders. Strong sales of the iPhone 6 and iPhone 6+ and AAPL's robust financial position are key growth drivers. The launch of the new iPhones broadened AAPL's base in Asia, with greater than 50% of the smartphone market share in Japan, market share gains in South Korea versus Samsung, and a boost of its market share in China to 12%. Other growth drivers could include AAPL's new mobile payment system, Apple Pay, the company's entry into the smart watch market with the launch of Apple Watch, and AAPL's new Apple Music streaming service. AAPL's retail business remains strong, with a notable partnership with IBM aimed at integrating IBM's Big Data and analytics capabilities with AAPL products. Furthermore, the iTunes store continues to deliver strong sales. I purchased 44 shares of AAPL in two batches of 22 shares each, adding $91.52 to DivGro's projected annual dividend income. My portfolio has been updated to reflect these purchases. Jun 30, 2015: Bought 22 shares of AAPL at $121.98 per share. Aug 10, 2015: Bought 22 shares of AAPL at $118.43 per share.